St Swithun’s lies on the Pilgrims’ Way, in the centre of the new Parish. A church is mentioned in the Domesday Book when the land belonged to the local monastery. The nave of the present church was built in the mid twelfth century and the north and south doors are also Norman. In the 1860s an apsidal chancel was added and the roof of the nave opened so that the oak-panelled roof was made visible. In 2007 pews at the rear of the church were removed to give some flexibility. Otherwise the church, which seats about 120, retains its Victorian pews and its pipe organ, giving it a unique atmosphere among the Valley churches. 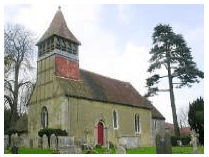 St Swithun’s has the benefit of lying immediately opposite the small Martyr Worthy Village Hall which is often used with it, creating a particular village community identity. It is also the focus for the annual “Way of the Cross” re-enactment of the Passion, a very popular and moving dramatic event as it moves up Church Lane on Good Friday. 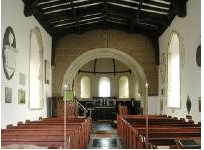 To find out more about the history of St. Swithun’s and the village of Martyr Worthy the British History Online is a wealth of information.